June 2014 - Pebbles, Inc. 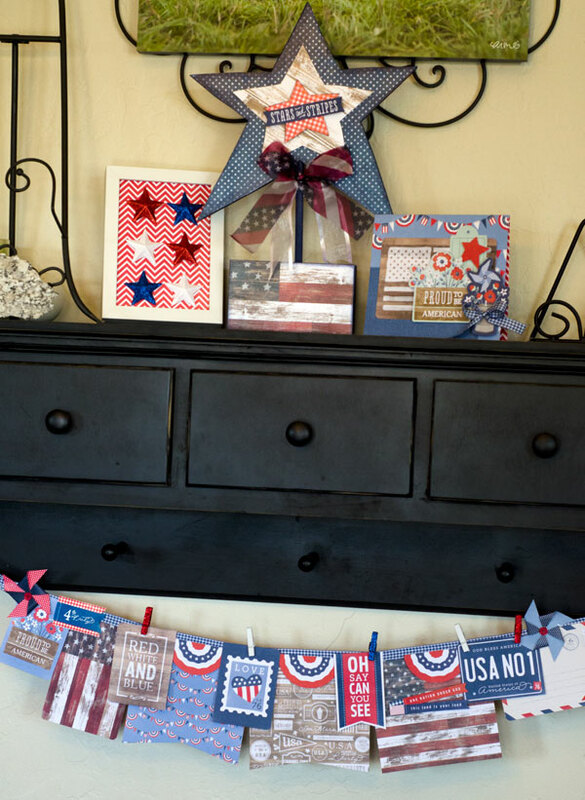 Kicking off our week and helping us get in the Fourth of July spirit, Amanda Coleman brings us this bold and patriotic American Flag home decor . Happy Fourth of July week, everyone! 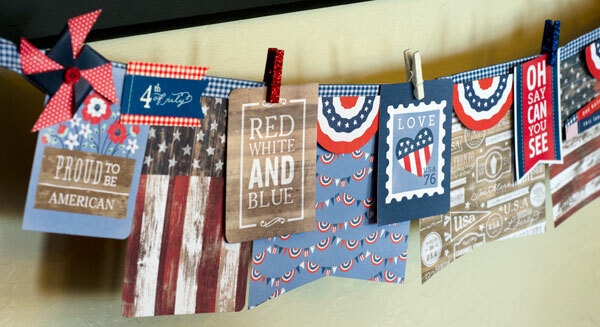 Amanda here today with a piece of easy and inexpensive patriotic decor that is sure to liven up your space this holiday weekend. 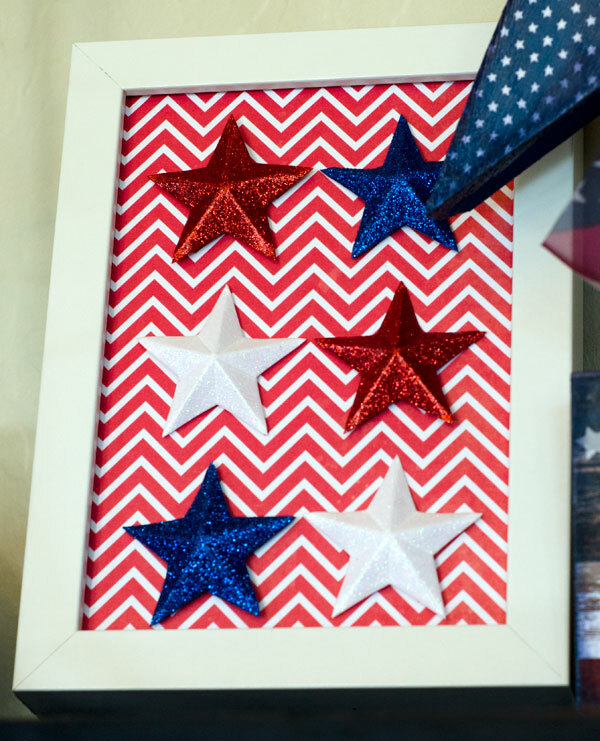 ​With only a couple pieces of patterned paper and a basic 8″x10″ frame, you can make a quick and easy piece of Fourth of July decor that is sure to brighten your space all summer long. 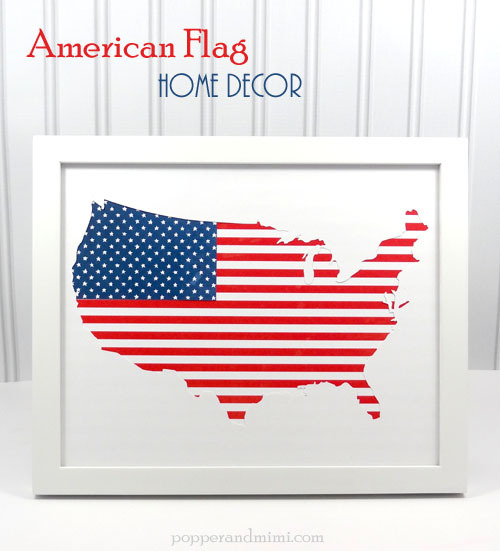 Hang this brightly colored American flag map on a wall or add to your holiday mantel. 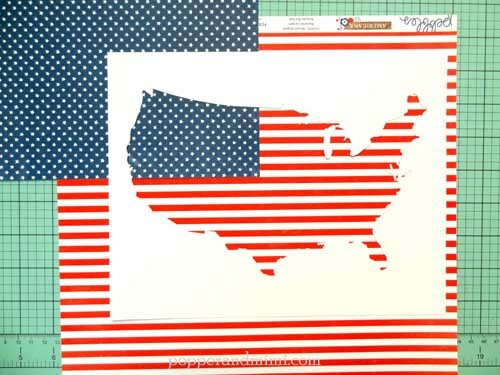 I used a USA map cut file from the Silhouette store to create my decor. I prefer this map because there is slightly less detail in the outline making it a little less fussy to cut. 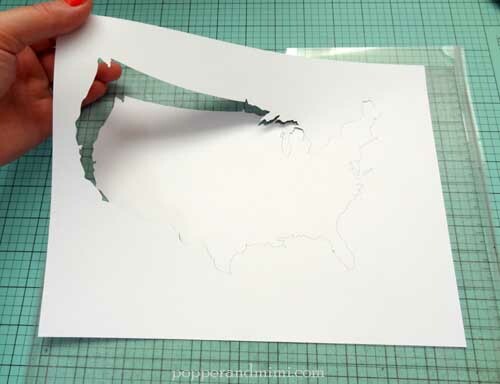 Die cut the map from white cardstock and gently peel the negative of the die cut to use in your decor. Use the grids in your die cutting software to help determine the size and placement if your map. 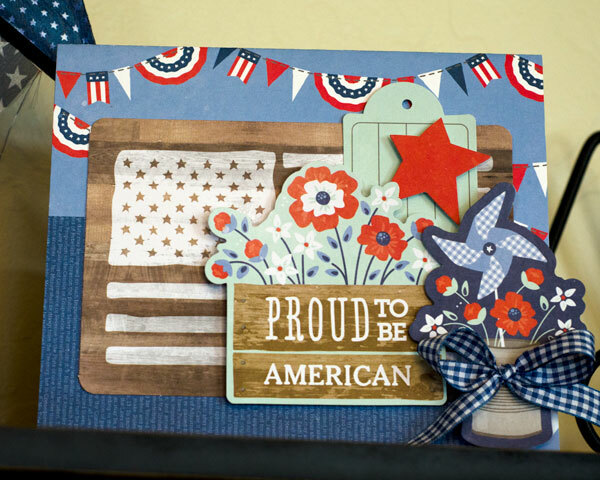 ​Determine the placement of the stars and striped paper by placing the 12″x12″ sheets under your die cut. After you have decided where you want your paper, trim the patterned paper and adhere it to the back of the die cut. ​The bright reds and blues will contrast nicely with the white background leaving you with a piece of eye-catching decor. 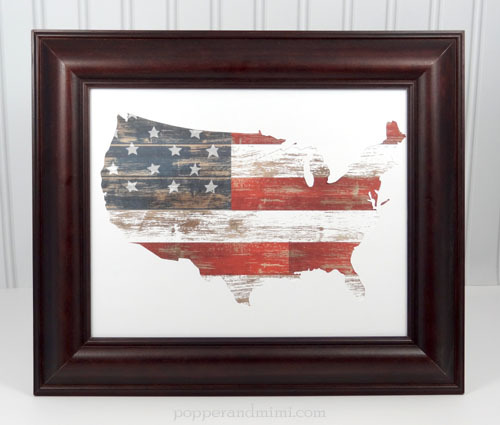 If rustic charm suits your style, you can make a similar American flag map by placing a sheet of Old Glory paper behind your die cut. 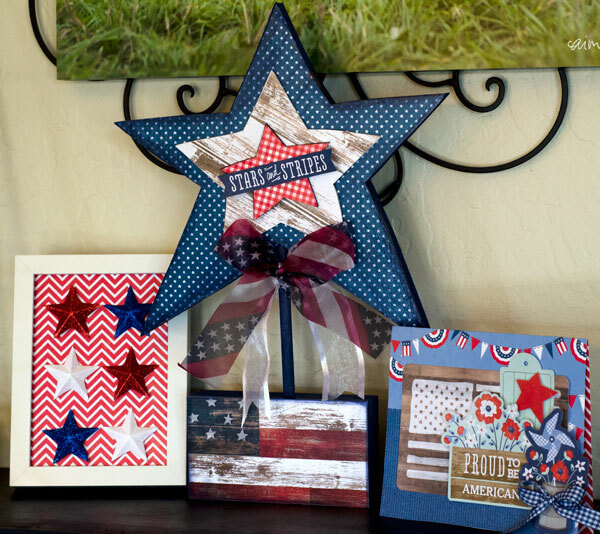 To wrap up our Red, White and Blue week, we have some beautiful and patriotic home decor by Tiffany Hood. 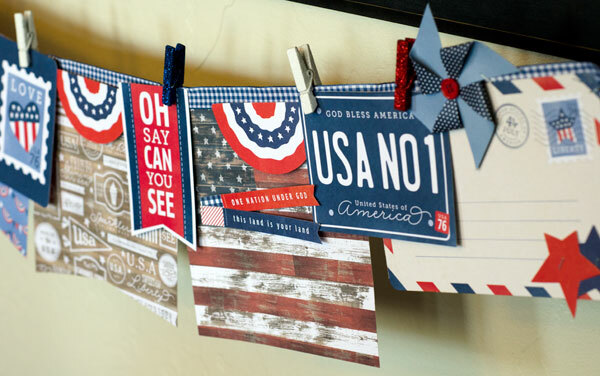 These pieces will be the perfect finishing touches to tie together all of your Fourth of July decorations. These decor pieces were all done using mostly pre-cut die-cut pieces or pre-made embellishments from the Pebbles Americana collection. The banner came together quickly with papers from the 6×6 paper pad and cards from the Journaling Cards pack. I embellished it with a few dimensional pinwheels, clothes pins, and ribbon, and adhered most of it with staples. No adhesive required other than a few dimensional foam adhesive pieces. The wood star was done with Mod Podge and distressed with ink, and the other two pieces came together quickly with Pebbles’ pre-made embellishments. 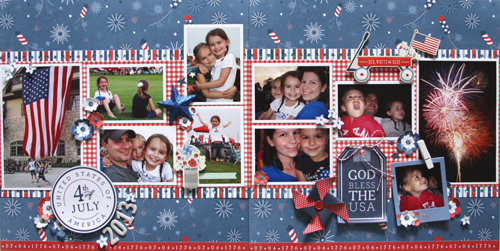 This two-page red, white and blue scrapbook layout by Renee Zwirek is the perfect way to capture Fourth of July memories! 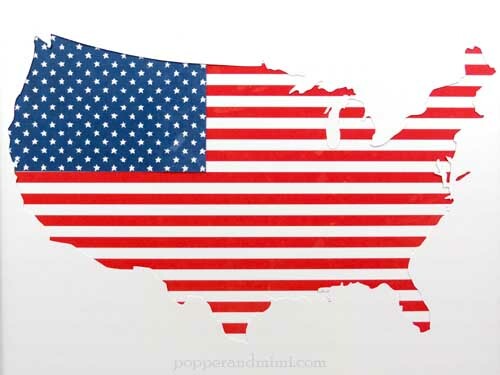 When I think of Red, White, and Blue, I can’t help but think of America and the 4th of July. 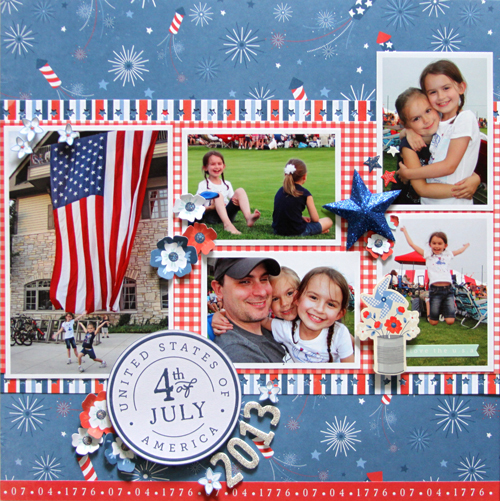 So, I made this double page layout using the Americana collection and my favorite 4th of July photos from last year. My photos measure 4” x 6”, 2.5” x 3.5”, and 2.25” x 2.25” (the photo in the blue frame). I arranged them to run horizontal across my two pages. My photos began with my girls under the large American flag and ended with the spectacular fireworks show. 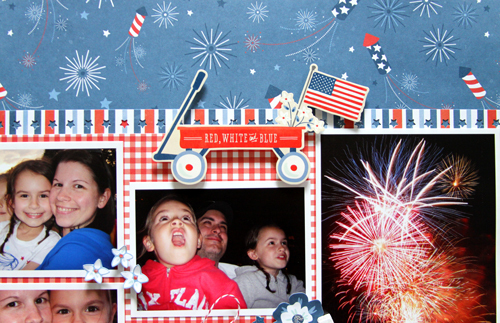 I used the pretty blue sky with fireworks papers for my background. 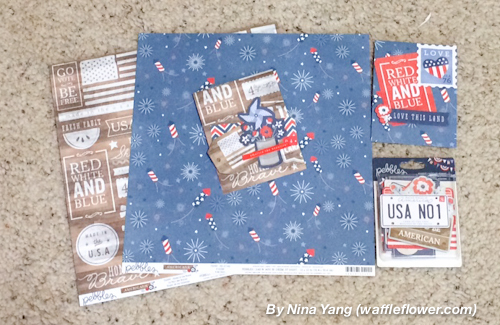 I punched a star border on the red, white, and blue striped paper to add a bit of fun along the red gingham paper that I used to center my photos. For my title, I used a Printed Cardstock Shape and added the year around it with Cherish Thickers. 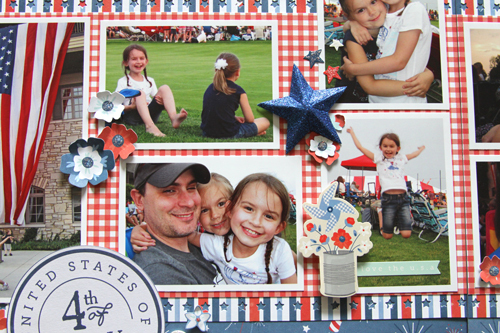 I added Stickers and hand-cut flowers from the Liberty pattern paper around my photos. 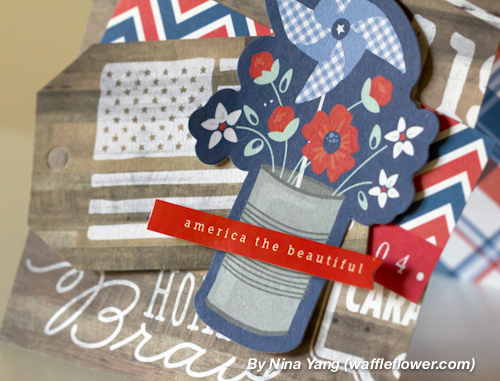 On the right-side of my double page layout, I added a pretty Pinwheel, “God Bless the U.S.A.” tag, stickers, and more hand-cut flowers. 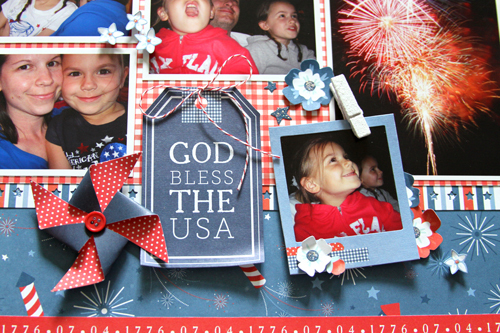 I especially love the frame with clothespin that I used to add a photo of Payton looking up with delight at the fireworks show. With just over a week left to go before the Fourth of July, we’re finalizing plans and getting ready to party. 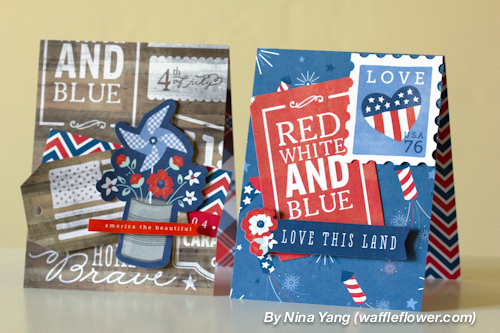 If you’re hosting a party this year, or even if you’re just attending one, these sweet handmade patriotic cards created by Nina Yang, may just be for you! Hello everyone! Nina here again! 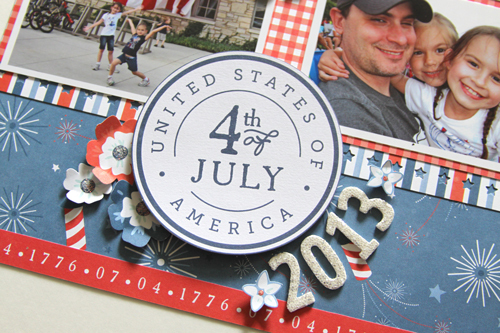 Today I am sharing a couple of quick and easy 4th of July cards using our Americana collection! 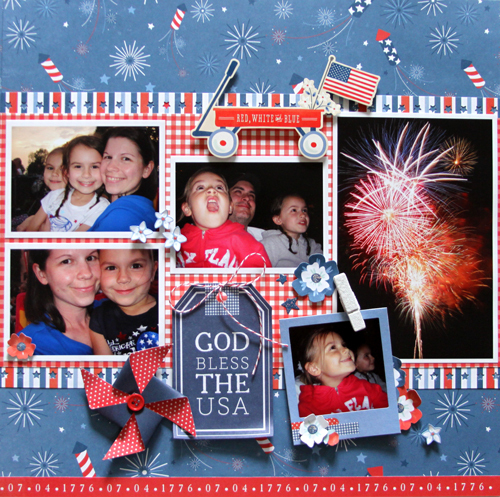 I used “4th of July” and “Home of the Brave”12×12 paper as well as the lovely printed cardstock shapes for this project. 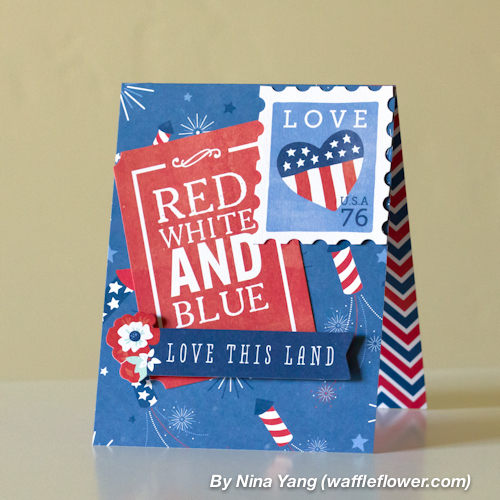 I created the card base from the 4th of July paper, leaving the fireworks pattern in the background and layered some cardstock shapes on top. How cute are these shapes?! I did the same thing on my second card but used lots of neutrals to tone it down a little for a softer impression. I used foam adhesives to add some extra dimension to the card. 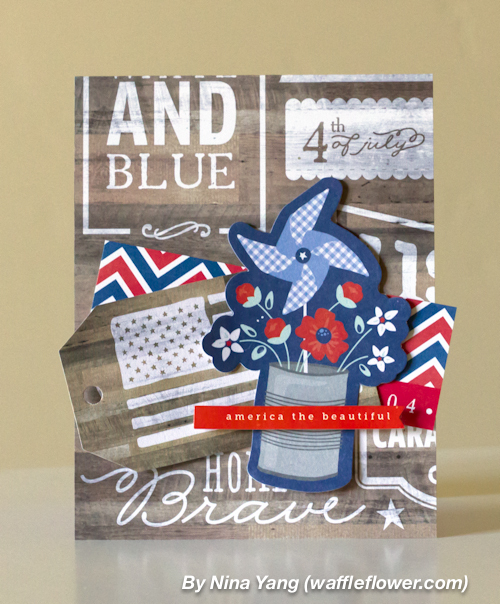 The sentiment “America the beautiful” is from the sticker sheet in the Americana collection. Thank you for stopping by! Happy 4th! 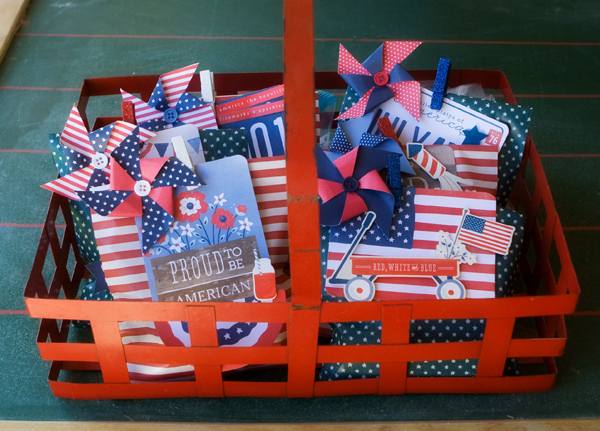 Check out these festive and patriotic treat bags by Kim Kesti. 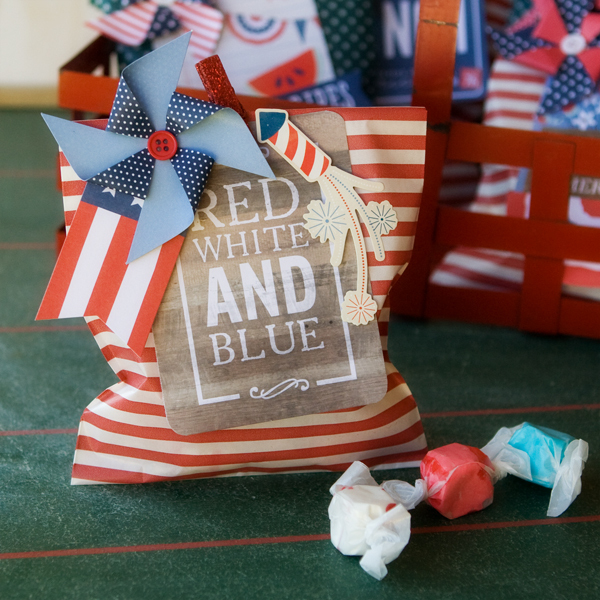 They are absolutely perfect for all your Fourth of July goodies! We have a fun summer tradition centered on the 4th of July. Not only is it our nation’s birthday, it is also my Mom’s special day. Yes, as a child she thought all those wonderful fireworks were in honor of her birthday! Nowadays, the grandkids help Grandma celebrate by gathering together, often at my parent’s cabin in the woods. The highlight of the weekend is a treasure hunt. This year, I created these fun treat bags as prizes for the winners. 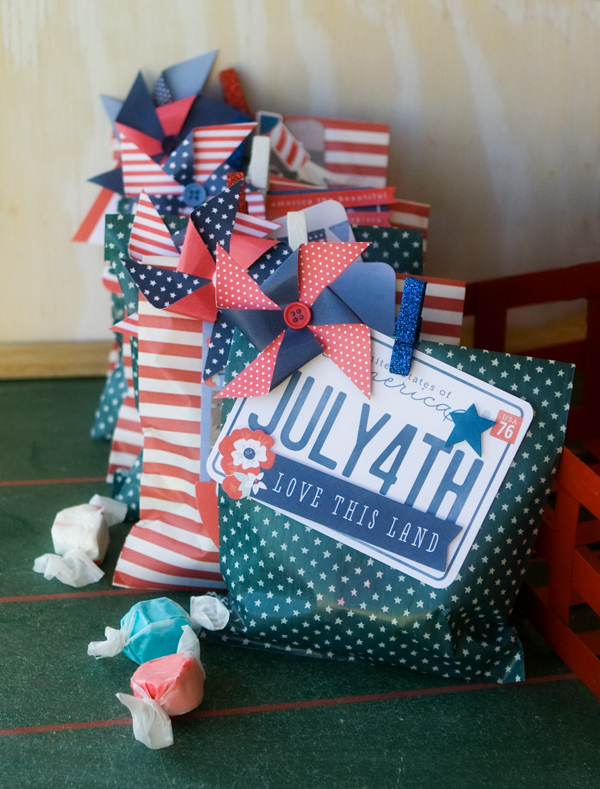 They were super easy to make, the Americana Printed Bags come in a pack of 24, so you will have plenty to go around. I filled the bags, clipped them shut with clothespins then added a cute layered label. Don’t you just love the pinwheels? So cute! Every label turned out so unique and fun! By using just a few supplies, I was able to mass produce the treat bags in no time at all! Try them for your next summer celebration!